Live by the semiconductor, die by the semiconductor. The last two years have been a semi-charmed period for South Korean exports. As semiconductor demand and prices rose, so too did South Korean exports. But what has been a fortuitous period for South Korean exports may be coming to an end. The boom in demand for semiconductors came right when South Korea needed it. After a record $572.7 billion in exports in 2014, South Korea saw total exports fall for two consecutive years for the first time in 58 years. Exports bottomed out at $495.4 billion in 2016, also falling below $500 billion for the first time since 2010. By 2017, South Korean exports had bounced back to a new high of $573.7 billion, and are on pace to exceed that amount in 2018 when the final numbers are released. However, unlike the sharp bounce back after the Global Financial Crisis, this bounce back was due in large part thanks to the beginning of a super-cycle in semiconductors rather than an upswing in global economic growth. While South Korean firms produce processing chips, they have come to dominate in the memory segment. Samsung and SK Hynix account for roughly 75 percent of the DRAM market, with Samsung alone accounting for 45 percent of the market. In the submarket for mobile DRAM, Samsung is even more dominant, with a market share that exceeds 56 percent. The rest of the DRAM market is largely taken up by the Micron Group. In the NAND flash memory market, where Samsung and SK Hynix face more competition, they only account for slightly more than 45 percent. This market dominance meant that South Korea, and by extension Samsung and SK Hynix, was well placed to take advantage of the super-cycle that is drawing to a close. Global prices for DRAM more than doubled in a year beginning in June of 2016 and only peaked in January of 2018, though prices are down more than 30 percent since the peak. Sales of DRAM grew as well, by 77 percent in 2017 and an expected additional 39 percent in 2018. With the growing demand for DRAM, South Korean exports of memory chips grew from $31.6 billion in 2016 to $78.1 billion through the first 11 months of 2018. As a result of these trends, South Korea’s economy has increasingly become reliant on Samsung, and Samsung has increasingly become reliant on semiconductors. Memory chips alone have grown from 5 percent of exports in 2014 to 14 percent of South Korean exports through the first 11 months of 2018. Total exports of both memory and processor chips accounted for 17.7 percent of South Korea’s exports in 2018. To put that in perspective, automobiles only accounts for around 6.7 percent of South Korean exports. More than 40 percent in the growth of all South Korean exports in 2017 came from memory chips alone. At the same time, other key exports such as automobiles, steel, and ships have either declined or essentially been flat. In addition, steel exports now face quotas in the United States and the prospect of high tariffs in the European Union. For Samsung, semiconductors are an increasingly large share of operating profits. Operating profits have grown from 26.41 trillion Korean won in 2015, prior to the super-cycle beginning, to 48.04 trillion Korean won through the first three quarters of 2018. During that same period, semiconductors have gone from accounting for 48.4 percent of operating profits in 2015, to 77 percent in 2018. At the same time, the division that produces smartphones has seen its share of operating profits drop from 38.4 percent to 18 percent on largely flat growth in operating profit. If the last two years have been extremely positive for South Korea’s semiconductor production, the year ahead could be significantly more difficult. Sales of DRAM are expected to decline by 1 percent, while the price is expected to decline by more than 10 percent in the first quarter. The immediate prospects are not good with demand for smartphones, computers, and data centers, the primary consumers of memory chips, all weak. In its recent guidance on earnings, Samsung suggested that a significant slowdown in demand from data centers and other macro factors, meaning the slowdown in China, were the primary reason its fourth quarter earnings will be below expectations. Apple has also suggested that China is slowing. Recent data from the Korean Customs Service also suggests a slowdown in China from the trade tensions with the United States, as the growth in exports of memory chips to China began slowing in October and was essentially flat in November. 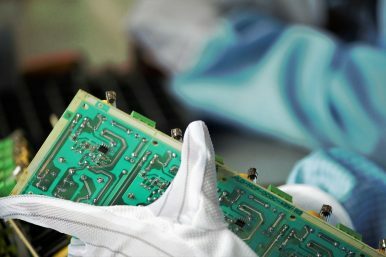 Even once the trade tensions between the United States and China fade, and demand for memory chips resumes, South Korea will face increasing competition to maintain its market share. China has made developing its semiconductor industry a priority under its Made in China 2025 plan. Telecommunications firms, such as Huawei, are moving to develop their own semiconductors to reduce dependence on foreign suppliers. In addition, the Chinese government-backed Yangtze Memory Technology (YMT) plans to introduce a new NAND chip that it claims provides “faster transmission speed and higher performance” than other products on the market. YMT was only founded in 2016 and has already received interest from Apple, the world’s biggest consumer of NAND. YMT, along with two other Chinese firms, are planning on moving toward mass production of DRAM this year as well. In addition to increased competition, Samsung and SK Hynix face potential legal troubles. Earlier this year, China opened an investigation into DRAM prices and claims to have evidence that the three primary producers have engaged in price fixing behavior. Depending on the result of the investigation, China could fine Samsung, SK Hynix, and Micron, or place other restrictions on the three companies. Samsung and SK Hynix have taken steps to address these challenges. Both firms are investing in R&D to maintain a technological edge over China, while also reducing capital expenditures to prevent oversupply from further depressing prices. Samsung has also begun moving into new growth markets, such as automotive chips, where its first new chip will power Audi’s infotainment systems from 2021. While the development of the internet of things and autonomous vehicles will create increasing demand for semiconductors, there will also be increasing competition. South Korea has been able to take advantage of the current super-cycle, but in doing so it has become increasingly dependent on exports of semiconductors and its largest firm has as well. A bit more diversity would benefit both South Korea and Samsung. Troy Stangarone is currently a Posco Visiting Fellow at the East-West Center. He is on leave from the Korea Economic Institute where he is the Senior Director for Congressional Affairs and Trade. In this contest, being first won’t be enough in the long term.